One Bedroom Apartment with a Spectacular view of Signal Hill, the Narrows and the Downtown. This property boasts the most spectacular view of the Narrows that the City of St. John's has to offer as you enjoy all the comforts of home. From here you can spot icebergs, whales, all of the ships coming in and out of the harbour and a view of the downtown. It is also perched on top of Jellybean Row, at the top of the most photographed street in the City. Close to parks, coffee shops, shopping, grocery, etc. As a guest of the Queen's Road Suites we are offering you and a friend exclusive pricing on a dinner and a show at The Spirit of Newfoundland Productions theatre and the well known Screech Room. As our guest of the apartment, you will receive the show and a full 3 course meal at an exclusive rate of $38.00. The regular rate is $68.00 for the general public. We do daily Screech-Ins 2:30 and 4:00. We are looking forward to hearing from you. Apartment sits perched over the infamous Jellybean Row. You can eaisly see Signal Hill and the Narrows. You can evenn see whales blowing and jumping in the distance. Beautiful apartment with excellent view. 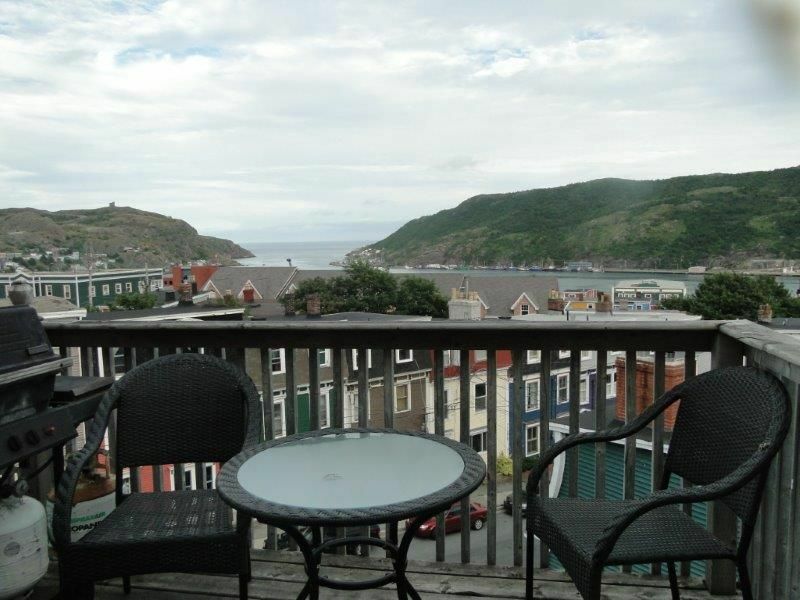 I loved this apartment, especially the view of St John’s harbour. Also close to downtown which is nice for exploring and restaurants. Great apartment, wonderful view, terrific location!!! A spacious and comfortable place that could benefit from conscious maintenance. The location is great. The view of the Harbour is most enjoyable. Boats and all that. The apt is spacious and the deck is very enjoyable. Though it could use more than one coat of paint. The kitchen is well equipped, but the skillets are showing their age. Windows can be opened on both sides to admit a cooling breeze. We were comfortable in this unit and would recommend it to anyone who can manage the two flights of stairs. This four story apartment building is well situated and central to all the sights. View of harbour from balcony fantastic! Apartment is huge, location central to all sightseeing ( a walking town). However, it is definitely in need of some loving care, and most of all, better housecleaning. Grout dirty, dusty surfaces, musty odors (as if linens were not fully dried). There are several better maintained apartment buildings on same street, although rates may be higher. Very spacious apartment with fantastic views of the Harbour. Loved sitting out on the balcony and watching the boats come and go. Well stocked kitchen, very comfortable bed and the owner was easy to contact. Quite a few stairs as it is on the third floor - not a problem for us but may be a problem if you have trouble with stairs. Parking outside was easy and close to bars, restaurants etc. Would stay again! !